A few of us from our team had the lucky privilege of attending the recent Picture to Page Scrapbooking Show in Pakenham last week. 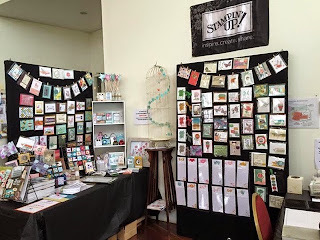 We had such a blast and it is always great to chat to lots of new people, people who are just as addicted to Stampin’ Up! as we are, and to wander the other stalls and learn some new tricks! This is a picture of our amazing stand where we got to show off our lovely creations, demonstrate some products and techniques and do a Make and Take. This was our fabulous team! We had an absolute blast. And it is always lovely when some of your customers pop in to say ‘Hello’ while they are there. Lots of people came to purchase the new catalogue! It goes live on the 2nd of June! Remember this is also the same day that this years catalogue and the occasions catalogue ends. That means that for the first time ever, for ONE DAY only, you can order products from all THREE catalogues on the same day! Do you have your new 2015 – 2016 Catalogue yet? I would love for you to have one, so as always, contact me so I can arrange for you to get one in your hot little hands! And stay tuned for some sneak peeks at products made with some of the new goodies!